Are you thinking of purchasing a new walkie-talkie but you aren’t sure which device would be the best model for you? Shopping the perfect walkie-talkie on yourself can be pretty hard. There are several factors you need to put into consideration for a device as tiny as a walkie-talkie. There are many models available in the today’s market, and for sure you don’t want to waste your hard-earned money on a device that does not fit your needs. You also don’t need to purchase over-expensive equipment with features which you’ll never use. This is the reason you require to do some research before you go on to purchase a two-way radio. With overwhelming varieties available, anyone may get confused. That’s why we have researched for you. Continue reading on to get more insights. They essentially offer a free means of communication- no monthly charges. They provide direct and instant communication – you don’t need to wait for a walkie-talkie to ring and connect. Provides the best services in case of emergencies and safety needs. They offer a lot of fun especially for the children who are too young for a mobile phone. Convenient and reliable- a walkie-talkie can prove to be more convenient than a cell phone or mobile if the distance involved is too short. Very Cheap – you can purchase a good walkie talkie for a pretty low price as well, averaging at the $40 mark. Modern Walkie Talkies are not bulky and ugly to look at — they are ergonomic, light and good looking for a practical everyday use. Simple and extremely easy to use. Limited by distance – can only be used around five miles on an average. One at a Time – only a single person can talk at a time. Limited to a specified Battery Life -, the standard model can last for around four months if used sparingly. ‘Tapping In’ – Other people may tune into your conversation and listen to you. What You Need To Know Before Buying. 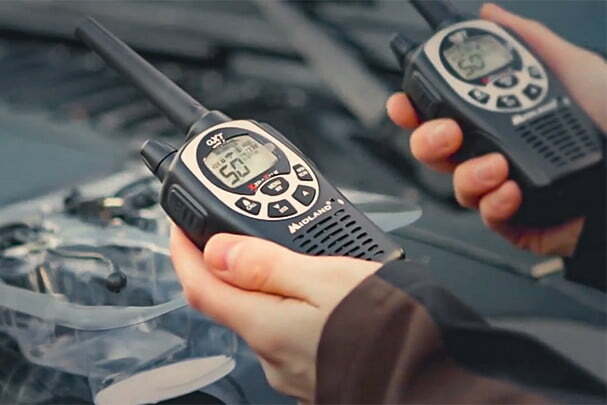 Frequencies: UHF vs. VHF: If buying new walkie-talkies for an already existing set, it is crucial to keep in mind that UHF radios won’t have the ability to communicate with VHF radios. While other receivers aren’t a consideration, a UHF set can be an ideal choice, in most circumstances. Channels: Walkie talkies are built to provide a variable number of channels. Some contain as few as two channels, when others may offer as many as 22 channels. More channels naturally equate to a higher price range. FRS and GMRS Service: Those radios which aren’t VHF or UHF will either be GMRS, FRS or both. Units for Family Radio Service are built for family and recreational purposes. FRS is a particular band of frequencies which is reserved by the FCC (Federal Communications Commission) for recreational and family use. Such radios w be won’t be durable enough for constant business use. Compatibility: As previously said, UHF radios are incompatible with VHF radios. It is, therefore, crucial to check this frequency, before buying, to make sure the radios will have the ability to receive and transmit to each other. Durability: Long life becomes a critical factor when the aimed job is one that demands a particular level of toughness. For construction workers, linemen, forklift operators, a walkie-talkie may be quickly dropped from a long distance which would crush any phone on the market. In such instances, a brick format is usually the most practical choice because these radios are conducive to rough treatment. Range: The majority of walkie-talkies are typically limited to a range of not more than one to two miles. This doesn’t say that communication at such a distance will be achieved by default, especially when there is interference. Any walkie-talkie that goes beyond this range exceeds the maximum range allowed by the FCC and thus will need a license for use. Weight and Size: Traditional Walkie-talkies may have been substantial and chunky, but modern technology has made it possible to pack massive power into a small space. This is what many walkie-talkie users are mostly looking for because they want the convenience of staying connected without the hassle of bulk. Transmission Power: Depending on the device model, a business radio runs between one to five watts. Expectedly, the higher the radio’s wattage, the higher the range as well as the price. Battery Life: Some models are made with rechargeable batteries. Other models may need single-use batteries of different sizes. The Midland LXT500VP3 is a great pair of a whopping 22 Channel GMRS walkie-talkies with as much as 24 Mile Range. They come with dual desktop charger and rechargeable batteries. The Midland LXT500VP3 features scan to check channels for activity and call alert for incoming call notification. These walkie talkies feature Hi/Lo Power Settings with a reliable Battery Save Circuit for longer battery life, Keypad Lock, and Roger Beep. As opposed to other GMRS walkie-talkies on the marketplace which utilize lithium batteries, Midland’s LXT500VP3 Dual Power choice enables the use of the “AAA” batteries or rechargeable batteries. 22 Channel GMRS with as much as 24 Mile Range. Features Call Alert for incoming call notification. Have a limited coverage of not more than 24 miles. With as little as $32, you can enjoy you can experience the reliability and convenience which Midland LXT500VP3 walkie talkies offer.Stay in touch with your employees in your office without the need to pay monthly bills. With these devices, you can communicate with anyone located as much as 24 miles away! This Motorola Talkabout MH230R is a must-have communication device for every outdoor addict. It features a strong range of as much as 23 miles. That said, this walkie talkie is excellent for friends and family to stay in touch whether you are trying to brave a crowded shopping mall or tackling a backcountry trail. The Motorola MH230 does not stop at the exceptional range. No! This lightweight and the compact device comes packed full of incredible features. Stay updated with real-time state of weather by initiating weather alerts or tuning the weather channel. With such features, you’ll always be well prepared for the unexpected. Eight-hour rechargeable battery life ten-hour alkaline. 11 weather channels with alert features. 22 channels each which come with 121 privacy codes for ultimate interference protection. Pair of 2-way radios with as much as 23-mile range. Comes with two radios, two belt clips, one charging adaptor, one dual drop-in charger, two NiMH rechargeable battery pack. Are you an outdoor addict looking for a compact, lightweight walkie-talkie that will revolutionize your outdoor adventure? If your answer is yes, then this is your best bet.The Motorola MH230 does not stop at being lightweight and compact; it also comes packed full of excellent features such as weather alerts and weather channels. Take the advantage now! Midland GXT1000VP4 is a Channel Waterproof GMRS walkie-talkies with NOAA Weather and All Hazard Alert. They come with Dual Desktop Charger, Headsets, Rechargeable Batteries, and 12-volt Vehicle Adapter. This GXT1000VP4 boasts a standard 22 GMRS Channels and additional 28 Channels. The device meets the JIS4 Standard of water exposure for 30 minutes and possesses the Maximum Power approved for GMRS Handheld Radios for as much as 36-Mile Range. The Weather Scan feature looks for the nearest NOAA broadcast to keep updated with the latest hazard and weather information. As opposed to other GMRS walkie-talkies on the marketplace which utilize lithium batteries, Midland’s LXT500VP3 Dual Power choice enables the use of the “AAA” batteries or rechargeable batteries. 50 Channels with as much as communication in 36 Miles. All Hazard/NOAA Weather Channels with Weather Alert and Weather Scan. Frequency Band of 462.550 – 467.7125MHz. Nine Levels of VOX to enable Hands-Free Operation. If you want a walkie-talkie for use in any adventure, Midland GXT1000VP4 should be at the top of your priorities. With a range of as much as 36 miles, they are ideal for any experience. What’s more is that the Midland’s GXT1000VP4 dual-way, 22-channel walkie talkie is built for General Mobile Radio Service (GMRS) operation in a weatherproof, rugged package. The Baofeng BF-F9 V2+ is the next generation of ham walkie-talkie, improving on the innovative UV-5R V2+ model with the new addition of Tri-Power cutting-edge functionality: This includes excellent transmission power of up to 8 watts, which is the most impressive feature ever made to date. This model has a well-expanded frequency range just like the UV-82. It also features a brand new chipset with noise-reduction capabilities which block out noises brought about by signal intensity changes together with tail tone elimination feature when receiving or transmitting signals between 50Hz-55Hz. The Baofeng tri-color display enables easy reading on the incredibly bright LCD. Tri-Power: High, Medium, and Low Settings. Has Frequency Range of 65-108MHz. Has Dual Standby or Dual Watch. Features A/B band independent operation. Top Quality, bright LCD screen featuring tri-color display for pure reading. If you are looking for a walkie-talkie that can be programmed without or with a PC to work on private repeater systems, then this is your best bet.The most versatile Baofeng also has excellent transmitting power which is selectable up to 8 watts. With such high features, this walkie talkie is the best choice for outdoor enthusiasts. Uniden GMR1635 is an ideal walkie-talkie for most activities. It features as much as 22 channels (5 GMRS /7 FRS ) and auto-squelch to lower interference. It boasts channel scan, monitor features, and several other convenient two-way basics such as Roger beep and call tones. This package comes with six AAA alkaline batteries, two radios, two belt clips as well as printed materials. You can utilize the walkie talkies when hiking, hunting, camping, or even staying in touch with another person in town. It’s stunning Roger beep and call tone assists you know when transmissions from and to someone are ending or beginning. Features 22 channels, which include 15 GMRS and 7 FRS channels. Roger beep allows others to know when you finish talking. Call tone sounds when calling one another. Scan assists you find other people in your area. Its packaging is 100 percent recyclable and is always printed with non-toxic inks. Limited range of 16 miles. Whether you are looking for a walkie-talkie for your hiking, hunting, and camping adventures or for staying in touch with another person in a crowded town, the GMR1635-2 walkie talkies provide plenty of excellent features including a range of as much as 16 miles. Like with other GMRS walkie-talkies, you will even enjoy more range in open areas than in places with several high buildings. With mobile phone coverage escalating every year, communication radios may be seen as an outdated technology. However, camping and hiking may put you outside the range of mobile phone towers. In such a case, these dual-way radios act as convenient communication gadgets whenever you are outside the cell phone service areas. There are thousands of walkie-talkies available in the today’s market, and thus you need to do thorough research before purchasing one. Luckily, we have done the hard job for you, and with our reviews, it will only take you a little time to find the gadget that is ideal for you. Wish you a great buying experience.